O'Gara and Wilson, Booksellers: Villainry, villainry, wherefore art thou villainry? Villainry, villainry, wherefore art thou villainry? I have a confession to make, gentle readers: I love villains. I love villainry! If I could be a villainess then I would do so. Swiftly and decisively. Since actual outsize villainry does not exist, I settle for trying to be a very moral and responsible girl. But seriously, I'd rather be a villainess. 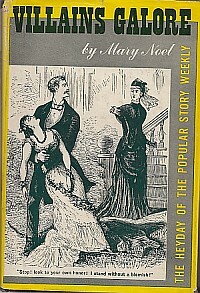 "Rosalind Valdar," he hissed, "my bed shall be your bed! My will shall be your master! My lust shall feed upon your charms, and your body shall be minister to my passions! I'll use thee -- use thee as I list -- and when I tire of thee I'll cast thee out into the streets for dogs to bark at; for men to sneer at; and for all honest women to shun! So will I do if you become not my wife!" Now that's a healthy relationship for you. But actually, that's an excerpt from an excerpt quoted in this book, and not a passage from the book itself -- because Villains Galore is a book about the low-priced weeklies that were filled with villains, rather than a book of villainry itself. $12.50, and you can think about villainous literary theory all you want! What's not to like? 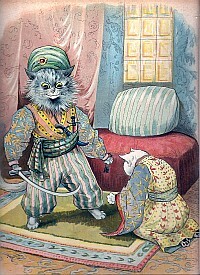 Louis Wain was a Victorian gentleman who liked to draw cats ... a lot. He drew them all the time. Eventually, he became famous for it! Everyone loved his cats! But then at some point I guess some folks decided that Wain was unbalanced, not to be trusted, etc. He spent the last fifteen years of his life in various mental institutions, and indeed, while Googling Wain I came upon this online Neuroscience Art Gallery feature on him: Cats Painted in the Progression of Psychosis of a Schizophrenic Artist. I enjoy the apparent progression rather a lot. And yet in the end he took their lives. 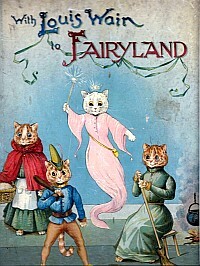 So if you're interested in fairy-tale doggerel by a pre-schizophrenic cat enthusiast, then there is just no way you can pass up this book. It seems that there are lots of people interested in that, because this item is a bargain at $950.00! Before it sells, I plan to study and see if I can dye my own hair blue. I'd like to murder some fine husbands before I die. ... arguably another macabre little joke. 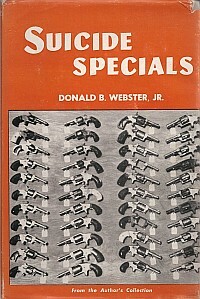 We actually do have a (perhaps surprising) number of gun-related books here at O'Gara and Wilson, and this was recently added to the group, but I think that perhaps it would be better in our Mystery section or even True Crime. Or maybe I should just make a section for "incredibly weird books that Lydia likes because she has been driven mad by spending long hours indoors with books when what she really needs is healthy fresh air; she'll be drawing cats next". So anyway, apparently certain guns are famously good only for committing suicide, and this is a primer for the discerning collector! The Introduction assures me that this book is needed (or was in 1958) because "the field is wide open" and "the scope of variation in these arms is incomprehensible". Only $60.00, my dear dear readers, and you'd better come buy it so that when I snap and go Bluebeard I won't be able to make my boyfriend's death look like a suicide. I think this place is twisting me, gentle readers. Till next time, au revoir, and I'll try not to go homicidally mad on the interim. at least 30 years ago, the NYT Magazine published a splendid feature on Wain's work, exploring how and why his work changed the way it did. I looked for a citation but couldn't find it though. Absence truly does make the mind grow fonder. Your blog is always so entertaining and informative. This wiki link on Wain gives more insight into his artistic changes.